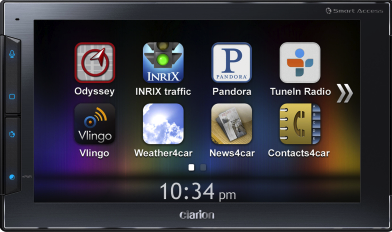 Clarion will try to bring smartphone app integration in your car through Next Gate. Announced at CTIA 2012 last week, Next Gate is a 7-inch touch screen device that looks like a GPS. It is not an in-dash receiver but a standalone piece of hardware that connects to your iPhone (4S only?) to display apps on it's larger screen. Next Gate can be mounted on your windshield, or if you live in places like California where windshield mounts have regulations, you can mount it on your dashboard. Next Gate connects to your iPhone via a cable which will also charge the phone. There is also a separate power cable which has to be plugged in the 12 volt power adapter in your car. In addition to app control, the device will connect to your phone over bluetooth for hands-free calling and an auxiliary audio connection for outputting sound over your car's speakers. Seems like a lot of different connections and wires running to and from the device. So which apps will be compatible on launch? Seems like TuneIn Radio, Pandora, Vlingo, INRIX Traffic and InfoGation. More apps will be compatible in the future. There is also a microSD card slot and built in stereo speakers. From the picture obtained from Clarion, it looks like a direct shot at Pioneer's AppRadio without the radio functionality. The advantage of such a device though is that you can carry it with you if you travel and use it in any rental vehicle. Also, it isn't as pricey as the AppRadio. You can read a more detailed report over at CNET by clicking this link. Next Gate will be priced at $269.99 and will be available at most major retailers like Best Buy and Amazon. The device is expected to be available for purchase only two weeks from now, on June 1. Is a portable AppRadioesque device like this more appealing?